Can you make a lasagna that's healthy and tastes great at the same time? Impossible you say? It's not only possible, but it's fantastic too! This recipe comes from good friend, Susan Hill, my Hearty Gal, Biker Chick and health and fitness mentor. She made this lasagna with whole wheat noodles and tofu! She has been telling me for years that tofu can be used like ricotta in Italian-style dishes. Both Susan and another co-worker, Phyllis, have also talked about the transformation power of freezing tofu before you cook it (kind of like water into wine and the body of the Lord into our daily bread. It's Easter, I'm on a transmogrification /transubstantiation kick here!) I'm slowly coming around to the realization that tofu can take on many culinary guises if you think outside the usual Asian/Indian flavors to which I've subjected it. I'm working on an Italian chicken cutlet dish that uses tofu - it's still in the working stages, but suffice it to say, marinating tofu in Italian salad dressing and then baking it yielded a decent "kosher-acceptable" version of "Spaghetti and Meatballs" that I could take to work for lunch at the 'gog. But back to this very healthy and vegetable packed lasagna recipe inspired by Susan Hill. There are a few things to know about this recipe, it's on the order of a Cooking Light Lighten Up swap-out. Pick and choose how many swaps you want to make. The version I'm offering is the full-up lightest, low-fat version I could make that tastes great and does not using faux ingredients. If you are substituting low-fat or non-fat cheeses, remember to layer the flavors along the way using spices and seasonings. There are many ways to take out the calories and keep in the taste, so many that you and anyone else eating this will never know you've made radical changes that are good for you. I used low-fat shredded mozzarella and non-fat ricotta cheeses, mixed with shredded low-fat firm tofu. The tofu was first frozen, in its container and then defrosted. This changes its texture, making the tofu meaty and dense. I used dried herbs, they fare better in longer cooked dishes and are readily available. I grilled zucchini and eggplant, to partially cook the vegetables; it also added a mellow smokey flavor. The carrots were coarsely grated, which added texture and avoided having to cook them first. The lasagna noodles were whole wheat. No par boiling was needed, I just used extra tomato sauce in the layers. This saved time and the unnecessary washing of an extra pot. The lasagna sets up more firmly because the noodles absorb the excess moisture from the vegetables and tomato sauce. Lastly, I added a small can of pumpkin puree to the tomato sauce, adding flavor, body, and fiber as well as stretching the sauce to accommodate the enormous lasagna I wound up making. It's important to have all of your ingredients prepped and ready before you start assembling the lasagna. Don't make the mistakes I did; I didn't have enough tomato sauce, ricotta mixture or a large enough baking pan ready when I started. I had to mix extras as I went along, foolishly thinking that I wouldn't need all of the ricotta or tomato sauce that I had available. I also didn't anticipate how big the lasagna would become. Plan to use at least a 9 by 13 deep baking pan or cake pan. You have to leave room for expansion of the noodles and for any over-flow of sauce should there be some spill-over. As for the ounce, cup and can measurements; some cans of tomato sauce, pumpkin puree and boxes of pasta vary by brand. Don't worry about small amounts, use what you have on hand, if it's a few ounces more, you'll use it. If it's short, don't worry about it. The over-all recipe is very forgiving. Go forth and experiment! Preheat the oven to 375 degrees. On a sheet tray or in a large mixing bowl, toss the zucchini and eggplant with the olive oil and season lightly with salt and freshly ground pepper. Arrange the vegetable slices on a preheated grill pan or arrange the zucchini and eggplant on sheet trays and roast in a preheated, 375 degree oven until its knife tender - not cooked all the way through, but still has some bite to it. If grilling the vegetables, grill on each side about 2-3 minutes. If roasting, cook for 10 minutes, turn the vegetables over and roast an additional 5 minutes. Transfer the cooked vegetables to a platter and cover lightly with aluminum foil; set aside to cool while you assemble the rest of the ingredients. Peel, wash and grate the carrots on the coarsest side of a box grater. Set them aside. Mix together the tomato sauce, pumpkin puree, 2 tablespoons of Italian Seasonings, minced garlic, 1 tablespoon of salt and 1 teaspoon freshly ground black pepper. Set aside to allow the dried seasonings to rehydrate in the tomato sauce mixture, while you move onto mixing together the ricotta and tofu. In a large mixing bowl, combine the ricotta cheese, crumbled/shredded tofu and the remaining 2 tablespoons of Italian seasonings. Taste and adjust seasonings, adding salt and freshly ground pepper to taste. Once the ricotta mixture is seasoned to your liking, add in the large egg and stir to combine. Set aside. Spoon some of the tomato sauce mixture onto the bottom of your lasagna pan. Layer the lasagna noodles on the bottom of the pan, breaking the noodles to fit the in the entire bottom layer. Spoon more tomato sauce on top of the noodles. Next add a layer of the ricotta mixture on top of the tomato sauce. Layer the eggplant on top of the ricotta. Spoon another layer of tomato sauce over the eggplant and then sprinkle with some of the shredded mozzarella cheese. 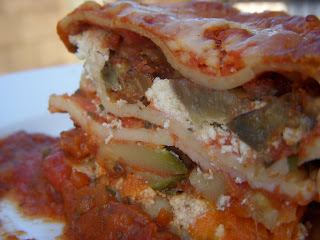 Add another layer of lasagna noodles over the eggplant layer. Spoon more tomato sauce over this next layer of noodles. Layer the zucchini over the tomato sauce and scatter more of the shredded mozzarella over the zucchini. Create another layer of lasagna noodles, repeating with adding more tomato sauce, the remaining ricotta cheese and the shredded carrots. Finish this layer with the last of the lasagna noodles and tomato sauce. Bake, covered with tin foil, in a preheated oven for 45 minutes. Uncover and sprinkle the remaining mozzarella cheese over the top and bake for another 15 minutes, or until the top layer of cheese is melted and begins to turn golden brown. Allow the lasagna to set for at least 30 minutes before cutting and serving.